45-57 Bowne Street, Flushing, NY 11355. Phone: (718) 460 8484 ext. 112. 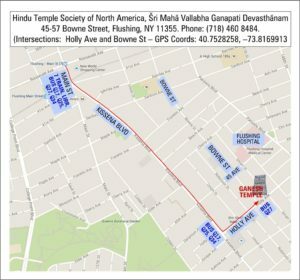 Intersections: Holly Ave and Bowne St.
Hindu Temple Society of North America is located in the town of Flushing in New York City. Detailed directions to reach the Temple have been given below. Please contact the Temple at hts@nyganeshtemple.org or (718) 460 8484 ext. 112 if you need any help with directions. Temple Hours : Weekdays 8:00 a.m. – 9:00 p.m. Weekends 7:30 a.m. – 9:00 p.m.
TEMPLE DRESS CODE: This is a place of worship – Proper Attire Requested Please for both men and women. NO shorts or skirts (above the knee) and/or ripped jeans. We will provide a dhoti/garment for wearing at a cost of $5.00. Your cooperation will be much appreciated. Both La Guardia Airport and JFK Airport of New York have frequent bus, train and taxi services to Flushing. Take Subway Train No. 7 from Times Square to Flushing Main Street (the last stop on 7 train). Then take MTA Bus Q27 from Main Street to Bowne Street on Holly Avenue. The bus runs on Kissena Blvd and turns left into Holly Ave Bus Stop. The next stop is Bowne Street near the temple. The bus ride is about 5 to 10 minutes. You may also take MTA Buses Q17, Q25 and Q34 to Kissena Blvd and Holly Avenue and walk two short blocks and turn left on Bowne Street for temple entrance on the right side or proceed straight on Holly Avenue for temple entrance on the left. Long Island Rail Road (LIRR) Trains from Penn Station / Woodside to Port Washington also stop in Flushing Main Street, adjacent to 7 train. (A) If you are driving from Manhattan or points West, take I-495 East (Long Island Expressway) to Exit 24 (Kissena Blvd) and turn LEFT at Kissena Blvd. (B) If you are driving from Long Island or points East, take I-495 West (Long Island Expressway) to Exit 24 (Kissena Blvd) and turn RIGHT at Kissena Blvd. Drive about a mile on Kissena Blvd and turn RIGHT into Holly Avenue. 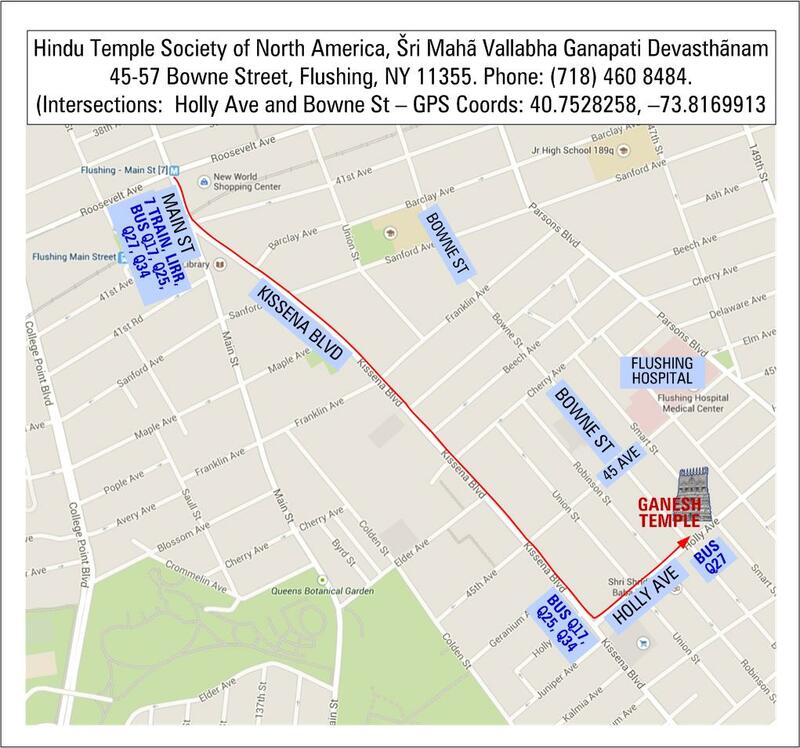 Drive 3 blocks on Holly Avenue to Bowne Street and turn left on Bowne Street for temple entrance on the right side or proceed straight on Holly Avenue for temple entrance on the left. (C) If you are driving from Connecticut or points North, take I-95 South to I-678 South (Van Wyck Expressway). After crossing Whitestone Bridge, stay on I-678 South (RIGHT lane) and take Exit 15 to 20th Ave. At the traffic light, turn LEFT into Parsons Blvd and drive about 2.5 miles. At Flushing Hospital Medical Center (on RIGHT), turn RIGHT into 45th Ave and drive two blocks and turn left on Smart Street. At Smart Street, turn LEFT and drive to the end of the street to Temple Parking Lot behind the temple. (D) If you are driving from Princeton, Philadelphia or points South, take I-278 via Staten Island and take Exit 35 to I-495 East (Long Island Expressway) and follow directions as above (A). Temple’s own limited parking facility is located behind the temple on Smart Street – just opposite to the Community Center and is available free of charge on first-come-first serve basis. Street parking is available in all streets around the temple. Devotees may also park their car just a block away at CENTRAL PARKING SYSTEM, next to Flushing Hospital on 45th Avenue. (Entrance via Burling Street.) Parking fee at this location is $5 per car if the stub is validated by the Temple counter or Community Center office. Click on the map below for directions to the Temple from Flushing Main Street.